It is not easy to get into a collector’s mind and understand the reasons why someone chooses to gather selected objects to be part of something bigger. Collecting is a very meaningful occupation. It is a process of deliberative selection of a group of objects “to be lifted out of the common purposes of daily life and to be appropriate to carry a significant investment of thought and feeling, and so also of time, trouble and resource”, in Susan Pearce’s words. 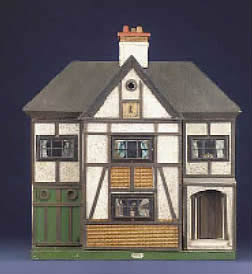 Dolls, dolls’ houses, toys and teddy bears, for some reason grew in importance in Faith Eaton’s life becoming, therefore, ‘sacred’ for her. She not only owned, selected or looked after them. She made them and was knowledgeable about them as well. 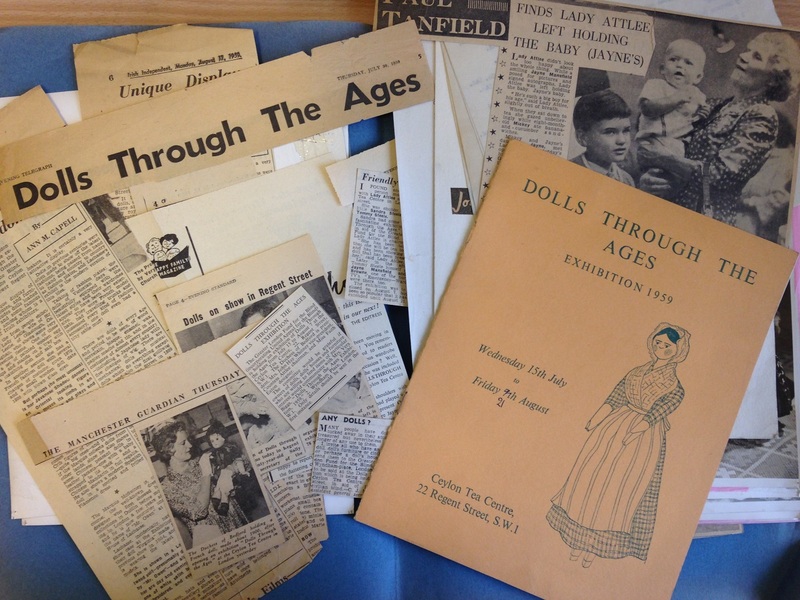 This archive provides some insights on why and how Faith drew her paths in the dolly’s world. 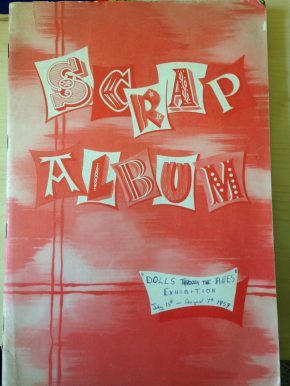 Once upon a time a young woman discovered three of her mother’s childhood dolls in a box in a seldom opened cupboard. . . you can guess what happened next. 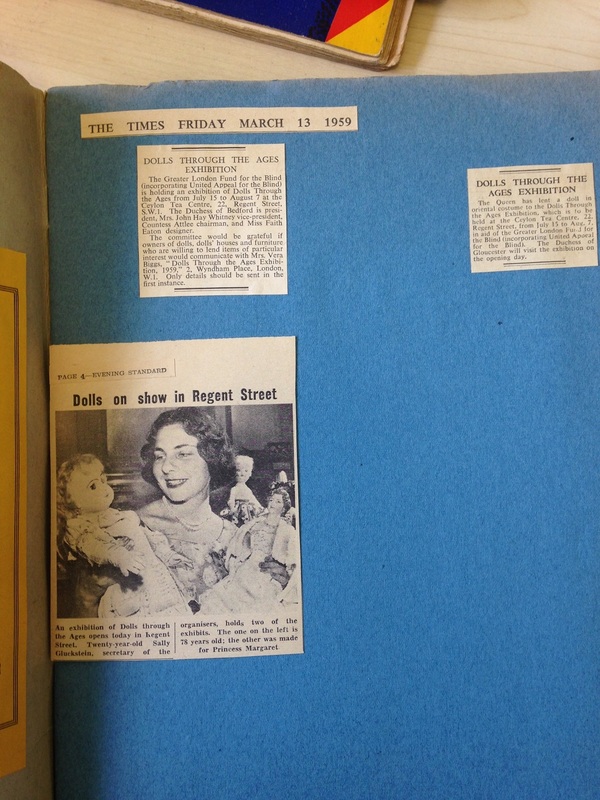 As this is fact not fiction I can add that this momentous find took place about 1950 – when English doll collectors were as rare as three-faced Brus. This quote shows us a mix of personal fascination and acknowledgment of the rarity of this field. 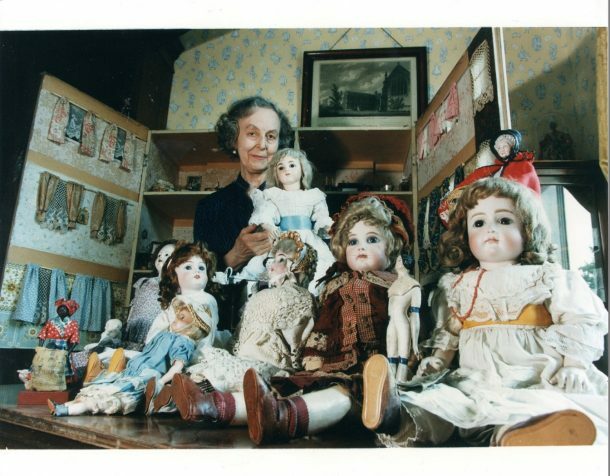 We do not know if she was sensible to the rarity of collecting dolls from the beginning of her career or it was something she learnt from her passion. However, the 1950s seemed to be a turning point not only for Faith’s career, and also for the practice of collecting dolls and doll’s house. A few important things happened in that decade. 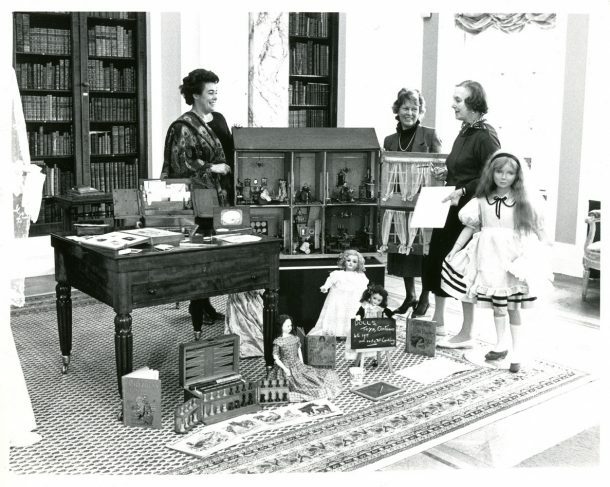 For instance, in 1953 Nerea de Clifford founded the Doll Club of Great Britain – whose mission is to ensure the preservation of dolls and dolls’ houses in addition to enable its members to share and expand their knowledge on this subject – and the V&A had started to dedicate the Bethnal Green Museum to the childhood, becoming later in the 1970s our lovely Museum of Childhood. Faith Eaton was in her early 30s and although she was a trained occupational therapist she was unable to pursue this career for health reasons, and decided to take up her interest for dolls and dolls’ houses in a professional way. Those dolls with long, long necks, and maybe with carved rings come from a land where long necks are the thing, and those with sloping shoulders tell us that at their time sloping shoulders and low cut dresses were the aim of fashionable ladies. How convenient to have one’s waist perpetually slim with no thought of diet, and to have tiny feet especially made where tiny feet are considered beautiful. Small button mouths which have just said ‘plum’, or lips parted to show teeth of straw or later of china. As we mentioned in previous posts, we found a great deal of scrapbooks in Faith’s archive. That was the way she worked in order to organise and collect information, pictures, newspaper/magazine cuttings on the subjects she was passionate about. It would not be different with the Dolls Through the Ages Exhibition. Although the majority of scrapbooks were fully completed with all the information glued or sellotaped on them, this one on the other hand was left unfinished as some of the newspapers cuttings are detached and not organised. Dolls Through the Ages Exhibition was probably Faith’s first exhibition but definitely not the last one. 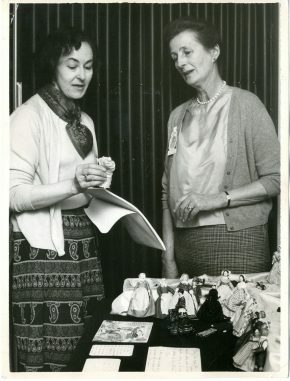 For instance, in 1962 she also took part in an exhibition with The British Toymakers Guild entitled “Toys”, showing there some characters toys in wood. Later in her career, in 1990, she would take her whole collection to be exhibited in Sledmere House, in Yorkshire. That exhibition received the title “Treasure of Childhood” and exhibited only objects that were part of Faith’s collection. 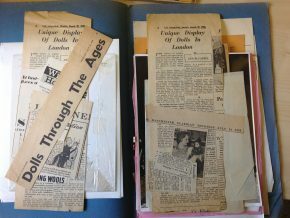 Faith’s scrapbook of the exhibition showed how proud she was of her collection, and the work that went into showing it off. Pearce, Susan M, 1995. On collecting. An investigation into collecting in the European tradition. London: Routledge. P. 23. Eaton, Faith. 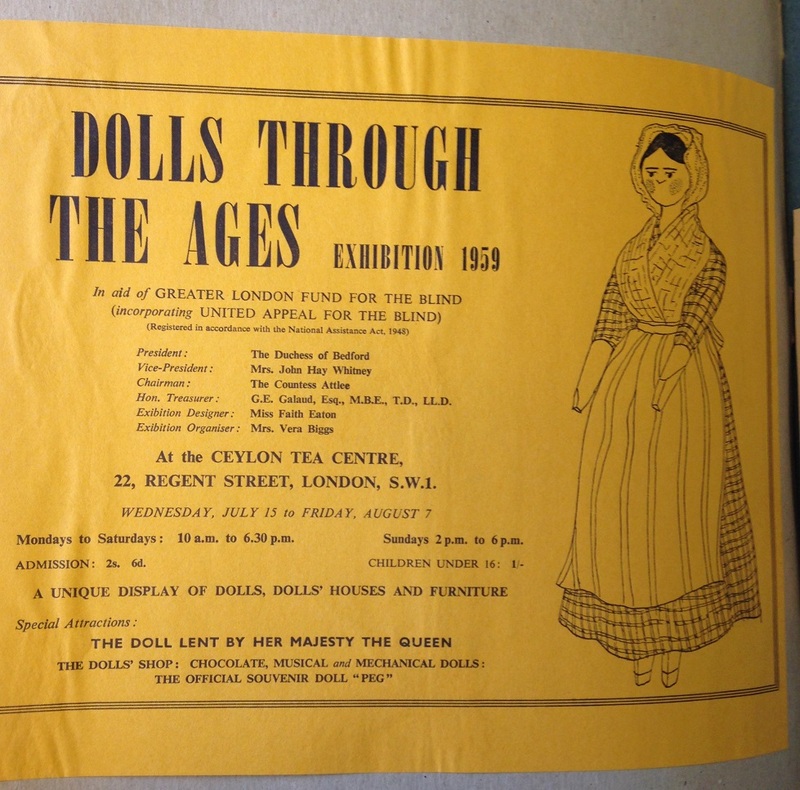 Antique Dolls, in Dollmaking & Collecting, n. 1, October/November 1980, pp.7-10. Thank you for this insight into Faith Eaton’s world. 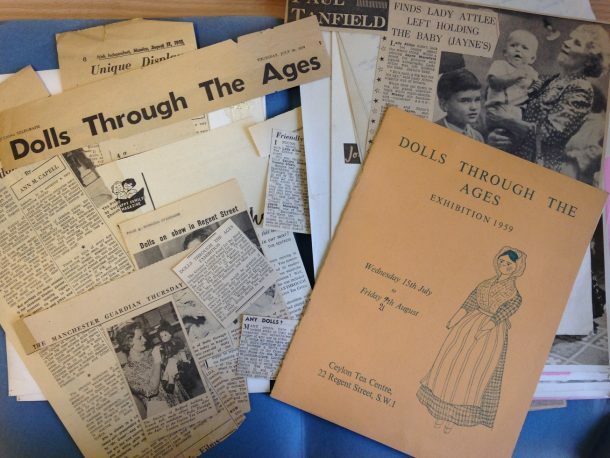 I have always found her and her collection fascinating and her book on Care and Repair of antique dolls essential to caring for my own small collection.